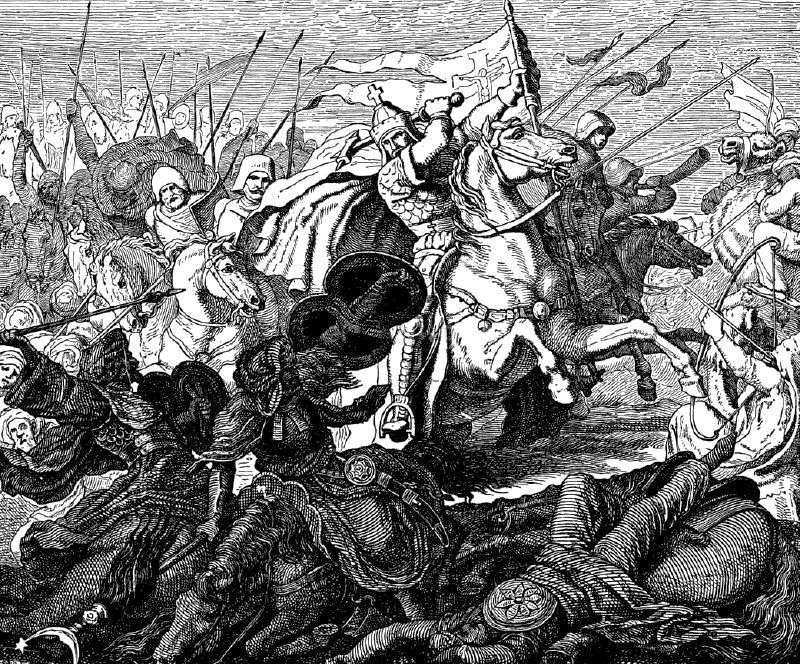 Precisely 100 years after the death of the Prophet Mohammed in 632, his Arab followers, after having fought across thousands of miles and conquered lands from Arabia to Spain, found themselves in Gaul, the territory that would become modern-day France, facing a hitherto little-known people, the Christian Franks. ...[T]he battle-hardened Frankish ruler, Charles, aware of their intentions, had begun rallying his liegemen to his standard. Having risen to power in France in 717 — the same year a mammoth Muslim army was laying siege to Byzantium — Charles appreciated the significance of the Islamic threat. Accordingly, he intercepted the invaders somewhere between Poitiers and Tours. The chroniclers give amazing numbers concerning the Muslims; some said as many as 300,000. Suffice it to say, the Franks were greatly outnumbered; most historians are content with the figures of 80,000 Muslims against 30,000 Franks. The Muslim force consisted mainly of cavalry and was geared for offensive warfare. The vast majority being of Berber extraction, they wore little armor, though their elite Arab overlords were at least chain-mailed. For arms, they relied on the sword and the lance; arrows were little used.